Come let us create the perfect getaway for you. 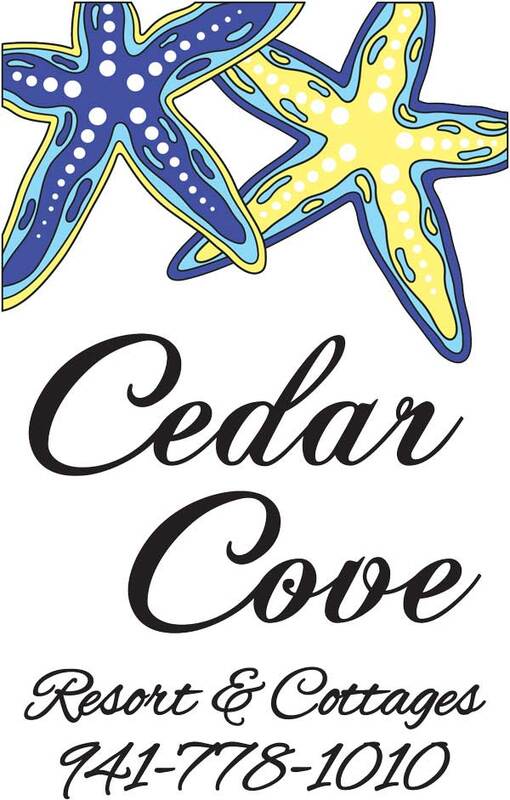 Whether you’re looking for a relaxing trip for two or a vacation the whole family is sure to remember, Cedar Cove Resort & Cottages has the perfect accommodations. Every room at Cedar Cove Resort & Cottages is uniquely decorated. Choose from a beachside room, a spacious suite or a private cottage. Our rooms offer king or queen sized beds, flat panel TVs and living space creating the perfect space for two or three. Our suites and cottages each unique in their décor offer amenities such as private bedrooms with plush bedding, fully equipped kitchens to make the perfect beach style meal and spacious living spaces. Outdoor living spaces offer views of the turquoise Gulf Coast or our lush, tropical gardens remind you that paradise is just outside your door. Cedar Cove offers serene, picture perfect views in the heart of Anna Maria Island. Call us at 800-206-6293 to book your vacation. Reservations are confirmed upon receipt of a deposit in the amount of (2) nights or 50% of the total, whichever is greater. Deposit checks must be received within 6 business days once the reservations are made. The balance, plus applicable tax is due upon check-in. All one bedroom and Studio pricing is based on 2 people, two bedrooms are based on 4 people any additional are $20.00 per night per person. Each suite has one parking space, please call if other vehicles will be joining you to check availability. Check out is at 10:00AM Check in time is 4:00 PM. The Resort is meant for the use of registered guests. We cannot accommodate pets. Rates and regulations are subject to change without notice. All suites are non smoking, exterior smoking areas are provided. 90 days for reservations between December 21st to April 30th inside these dates deposits are refunded if the unit is re rented for the entire stay, no sub-letting. There are no refunds or vouchers for cancellations within 21 days. Any lost revenue will be subtracted from any refund or voucher. A cancellation processing fee of 15% of the total reservation will be charged on all cancellations. Upon deposit received a change, i.e. lesser stay nights are non refundable with no voucher issued. There are no refunds for major holidays, special events or late arrivals or early departures. Please note that we require a major credit card and photo identification on check in. We do not overbook as many Resorts do, your room is exclusively held for you. To protect against unforeseen or unfortunate circumstances cropping up we suggest that you purchase Travel Insurance. What more can be said about the Sand Castle Penthouse, it has private balcony which offers a panoramic view of the Gulf of Mexico. Watch the dolphins play on the waves, watch the most fabulous sunsets in the entire world fall before your eyes. From breathtaking views to spacious accommodations, the Sand Castle Penthouse is sure to please. This suite is a two bedrooms,two bath accommodations. The master bedroom has a king bed with a large picture window, you have the perfect view of the turquoise Gulf Coast waters. The second bedroom has a queen size bed with a garden tub with shower. Open up the windows and allow the ocean breeze to fill the room. What more can be said about the Palm Penthouse, it has a private deck which offers a panoramic view of the Gulf of Mexico on Anna Maria Island. Watch the dolphins dance on the waves, watch the most glorious sunsets in the entire world fall before your eyes. The Palm Penthouse is perfect for honeymooners or those just looking for the perfect retreat. The living room of the Palm Penthouse offers a spacious living space featuring a large wrap around couch, allowing you ample space to relax. A four person dinning table creates the perfect setting for an intimate meal. When it's time for rest and relaxation retreat to your private bedroom and bath. Dream the night away in a pillow top king size bed. What more can be said about the Coconut Suite, it has a private balcony which offers a panoramic view of the Gulf of Mexico on Anna Maria Island. Watch the dolphins dance on the waves, watch the most glorious sunsets in the entire world fall before your eyes. The Coconut suite combines comfort with breathtaking views. A private bedroom featuring a cloud soft king bed offers the perfect escape for a peaceful nights rest. The living room is complete with a love seat, couch with a queen sleeper and flat screen TV. There is more than enough space to stretch out and enjoy yourself here in the Coconut Suite. What more can be said about the Sand Dollar Suite, it has a huge private deck which offers a panoramic view of the Gulf of Mexico watch the dolphins dance and view our beautiful sunsets. The private bedroom of the Sand Dollar Suite boasts a pillow top, king size bed with lush bedding and a gulf view from your window. The Starfish is the perfect place for three, with a queen bed and twin bed. A kitchenette area complete with all the amenities offers the perfect place to make an afternoon snack after soaking in the sun rays all afternoon. Just outside the door of the Starfish room is a courtyard with a twisting stone path through lush tropical gardens. Hibiscus and orchids are a gorgeous sight to see. Walk down a set of stairs and ten steps to the beach, who can resist. The Mango Room is the perfect place for three, with a queen bed and twin bed. A kitchen complete with all the amenities offers the perfect place to make an afternoon snack after soaking in the sun rays all afternoon. Just outside the door of the Mango Room is a courtyard with a twisting stone path through lush tropical gardens. Hibiscus and orchids are a gorgeous sight to see. Walk down a set of stairs and ten steps to the beach, who can resist. The Bird of Paradise Studio can simply be described as a beachy paradise. It has a spacious front porch with table and chairs. Just perfect for anyone who wants a great room for a great price. The studio features a queen bed perfect for ample rest and relaxation. The fully equipped kitchen is perfect for creating a beach style meal any time of day. Ideally located it is just a short walk from the white sand of our private beach. The Bamboo Suite is sure to impress inside and out, it is very unique as it is the only suite that has it's own large private deck with two sun loungers perfect for relaxing or the patio table, chairs and umbrella from which you have a gulf view and only steps from the beach. The spacious private bedroom features a king size bed perfect for getting a good nights rest. The kitchen and dinning area are perfect for a beach style meal. The living area rounds out the interior of this lovely suite. Relaxation comes with ease in the Flamingo Suite. The one-bedroom suite features a gulf view from your deck and a walk down through our beautiful courtyard on a cobblestone walkway right to the beach. The bedroom features a queen size bed for a peaceful nights sleep. The full sized kitchen makes meal preparation easy. The Coral Reef Suite is gorgeous inside and out. This suite is adorable, nestled in an island type setting amidst our coconut grove and just 30 steps from the beach, what more could you ask for? The suite offers a queen sized bed, which is just cozy for two. You will feel right at home with a fully equipped kitchen and sleeper sofa couch and two flat screen TV's. The Mermaid Suite is simply gorgeous inside and out. Space is not limited here with two separate bedrooms with a queen bed in each, two bathrooms, a good sized living room, dining room and kitchen plus two flat screen TV's. The best part about it, is from your deck you have a view of the Gulf of Mexico. Meander down a cobble stone pathway and within 30 steps your feet are on the beautiful beach. The Dolphin Suite offers spacious accommodations with an island feel that will make you not want to leave and just 40 steps to the Gulfs fine sugar white sand. This two-bedroom suite features an inviting King bed in one of the two private bedrooms. The second bedroom has two twin beds perfect for the family. A full kitchen, dining area and living area ensures that there is ample room for the entire family. You are just steps from the white sandy beach where you can see the Manatees and Dolphins dancing in the Gulf of Mexico. This two bedroom is absolutely perfect for your family retreat. Each bedroom has queen beds, one bathroom, full living room, dining room, kitchen and flat screen TV. Outside your door you have a very large patio with table and chairs and sun loungers. A short walk of 30 steps down the cobble stone walkway and you are right on the beautiful beach headed right to the Gulf of Mexico on Anna Maria Island. If you are looking for a three bedroom, two bath suite we can accommodate you, this suite easily converts into a 3 bedroom 2 bath with jacuzzi tub/shower. We are sure the Sunset will suit your needs. The Violet Cottage is a wonderfully charming cottage. The one bedroom cottage boasts a plush king sized bed perfect for that peaceful nights sleep. The fully equipped kitchen offers a stove, full sized refrigerator and microwave. The living area features a large couch perfect for cozying up with a book or watching a movie. This cottage is simply gorgeous. The Orchid Cottage is named after the abundant orchids that grow in the tropical gardens of Cedar Cove Resort & Cottages. A charming interior of the Orchid Cottage creates a relaxing and inviting feel. A private bedroom with a plush queen sized bed and beach style furniture. The patio is a wonderful place to relax before you start your day and you are just steps away from the beach. The Wildflower is the most unique and private cottage. The Wildflower offers a separate bedroom with a queen bed, full living room, dining room, kitchen. Two flat screen TV's, bathroom with shower/jacuzzi tub. Your deck over looks tropical gardens abundant with banana plants, orange trees, and key lime trees and just steps to the beach. The Key Lime Cottage best described by our guests as spectacular. This two bedroom, two bath cottage has enough space for the whole family. The living room has a nice wrap around couch with plenty of room for everyone and also has a queen sleeper sofa. One room features a plush king bed while the other has two twin beds. Relax in your oversized jacuzzi and watch the stress melt away, it also has 2 showers. The lovely Sunflower Cottage as you can see is sure to delight. A private studio bedroom with a plush king size bed perfect for that wonderful nights rest. The kitchen is fully equipped to make that perfect beach style dinner. The large open windows within the cottage create an open and airy feeling. Just outside your door you have a raised deck with table and chairs with a BBQ grill within steps from your deck.